I can't believe my sweet baby girl is just a few days shy from turning 8 months! Where has the time gone? The saying that your kids truly do grow up in the blink of an eye is so true. If you been reading my Leah posts from the beginning then you know she was blessed with so many clothes during my shower. Honestly, for the first few months with the exception of a few essentials we haven't had to buy her any new clothes. However as she started to grow and gain weight there's so many clothes she has left behind. Seriously, there's a bin full of clothes that's just overflowing with clothes that don't fit her. We want to donate some and keep some. Maybe baby number 2? Haha! We are definitely no where near there yet. Recently as the weather is changing we have had to buy her some new clothes to go with the weather. Like this awesome baby denim jacket I scored at Kohl's for $16! Guys, Kohl's is one of my favorite places to buy clothes for babies, their so many great pieces and fashionable ones too. I feel like I'm lacking in the mommy and me department so any chance I get to match with my favorite little person I'll take it. The denim jacket is perfect for the spring weather and fits her so comfortable. 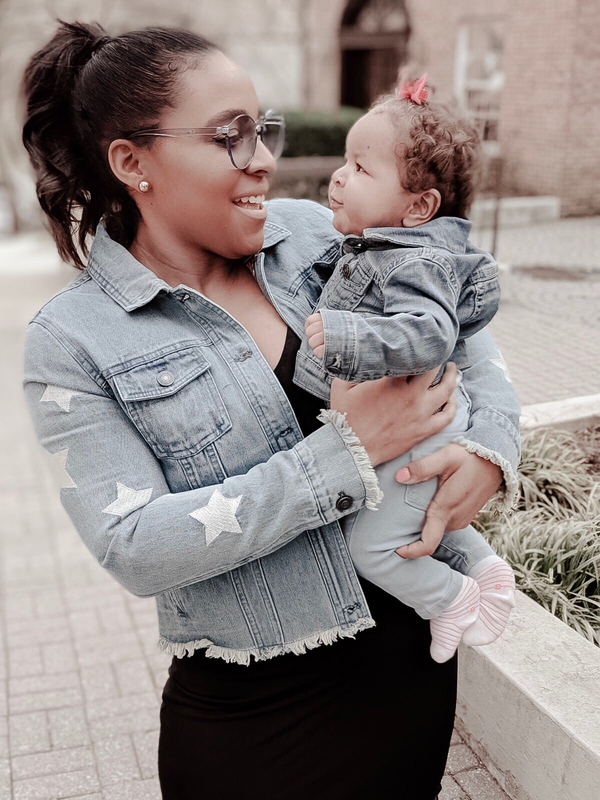 Below is a list of some of my favorite stores to shop for baby clothes and I linked a few cute pieces (boy and girl) below. Like I said Kohl's is great because of their cute trendy selections and great prices. They always have a sale and I love using my Kohl's cash every time I shop. Every time I go into Target for one thing I always end up getting a few things but that's just how the story goes for everyone. No? Even when I go to Target for just baby essentials I always find some goodies there for her. All those bows and hair accessories you see on her are from Target. Such a large retailer there's so many things and brands to choose from. With Amazon prime things come next day so that's always a plus. These two are great! My favorite is Old Navy because they have the cutest little outfits down to shoes. If you catch a good sale you can find baby clothes for even $5 and under. I love Carters because they have unique onesies and all types of baby clothes. If you have been following my highlights on IG that I created for Leah to post her outfits then most of those cool onesies are from Carters! Comment below if you have any favorites, I would love to try more stores and/or brands.